Colin Chiles, Stepnell operations director; Victoria Turner, Brackley Investments senior development surveyor; Jeff Moore Brackley Investments director; Kevin Fairman, Brunelcare chief executive; Steve Boardman, Brunelcare Chairman (centre with spade); Jan Little, Brunelcare director of care home; Sandra Payne, Brunelcare head of clinical excellence and James Harris, Stepnell project manager. 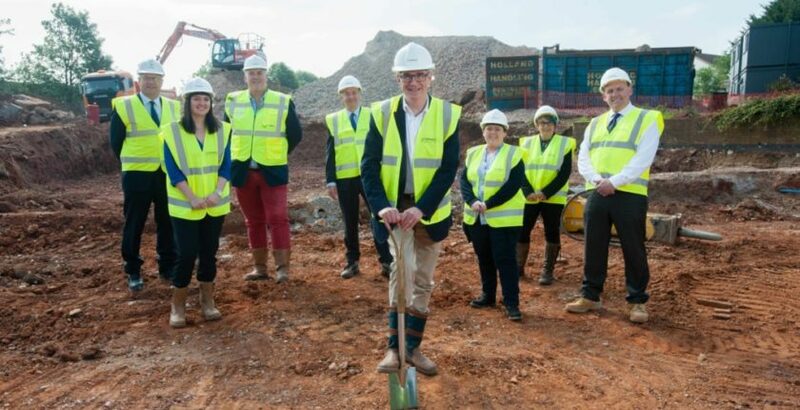 Construction specialist Stepnell has begun work on a £8.5m care home and reablement centre in South Gloucestershire. The 64-bed care home and 24-bed reablement facility in Cadbury Heath will be operated by Bristol housing and care provider Brunelcare. “We are proud to be playing a part in the delivery of this much-needed care scheme which will provide exceptionally well-designed high-quality care facilities for the wider South Gloucestershire community,” said James Harris, Stepnell project manager for the development. Little Heath care home will provide 64-ensuite bedrooms, dining and servery areas, as well as shared community amenities, including communal lounges, a hair and beauty salon, function room and shop, plus fitness and gym facilities. The scheme’s connecting Reablement Centre, which was designed by Roberts Limbrick Architects, will offer separate transitory accommodation and rehabilitation services for people leaving hospital in need of temporary step-down care before returning home. This facility will provide a further 24-ensuite bedrooms, a rehabilitation gym, shared lounge and dining facilities, and a kitchen to help residents regain their confidence and independence. Stepnell was awarded the scheme by care specialist Brackley Investments. Kevin Fairman, Brunelcare’s CEO, said: “This is excellent news in that we will be able to increase the number of care home places Brunelcare currently provides for people in the South West region by 20%, along with expanding our already successful reablement service, supporting people returning home from hospital.